Where Was George Gordon Meade? A Google search of the many sketches and paintings that have become the iconic, popular images of Robert E. Lee’s surrender at Appomattox Court House may unveil a startling revelation. The commander of the Army of the Potomac, the principle U.S. Army in the Eastern Theater was not present in Mr. McLean’s parlor on April 9, 1865. Thus this begs the question, where was George Gordon Meade? But in a larger sense, Meade’s absence was a culmination of almost a year of embarrassment. Taking command of the Army of the Potomac at the height of the Pennsylvania Invasion in the summer of 1863, George Meade responded superbly in the moment of crisis, directing his army to victory at Gettysburg. The following spring, the new General-in-Chief, Lt. Gen. Ulysses S. Grant decided to direct all field operations while traveling with Meade’s army. Meade was assured that he would be executing Grant’s strategy and that Grant would take a loose hand in the tactical fighting. Meade’s wife, however, was skeptical and urged her husband to resign. Her recommendations would fall on deaf ears and an already awkward situation for Meade would soon become intolerable. Beginning in the Wilderness, Grant began to taking a firmer role in directing the fighting. After a bungled march to Spotsylvania, Meade came to blows with Maj. Gen. Philip Sheridan, the commander of the army’s cavalry, over the latter’s failure to clear the way into the courthouse for the rest of the army. Rather than being censured for insubordination, Grant dispatched Sheridan on an expedition to the south to engage his Confederate counterparts. This decision completely usurped Meade’s authority. By the time the armies reached the North Anna River in the latter part of May, Meade had been relegated to a nominal position of being second in command. The Army of the Potomac was the property of U.S. Grant. Thoughts of resigning returned. Meade’s honor, however, along with a devout devotion to duty and to the Union could not bring him to leave the army. He stayed on, despite being passed up for command of Union forces in the Shenandoah Valley, through the Siege of Petersburg and Lee’s subsequent retreat. On April 9, 1865, Meade was approaching Appomattox Court House from the east when Lee finally surrendered. Unfortunately, the stalwart Pennsylvanian, who did not allow his personal honor get in the way of service to his country, was not present in Wilmer McLean’s front room. Still, Meade would meet with Lee on April 10. The two men had served together as Engineers during the Mexican War. Receiving the courtesy of passing through the Confederate lines, Meade made his way to Lee’s headquarters. Dismounting in front of the enemy commander, Meade greeted him cordially. Lee, unfortunately, did not recognize his comrade from the old days and thus, Meade had to reintroduce himself. Taken aback by his appearance, Lee commented “What are you doing with all that gray in your beard” to which Meade replied “You have to answer for most of it.” The two former enemies then entered Lee’s tent and chatted at length. Despite the hardships incurred by Grant’s presence, Meade remained steadfast, a true testament to his character. Beyond Grant, he was probably the one man who should have been present when Lee formally surrendered the Army of Northern Virginia. He had commanded the Army of the Potomac longer than any other officer and unlike his predecessors, could say that he had fairly beaten Lee on the field of battle. 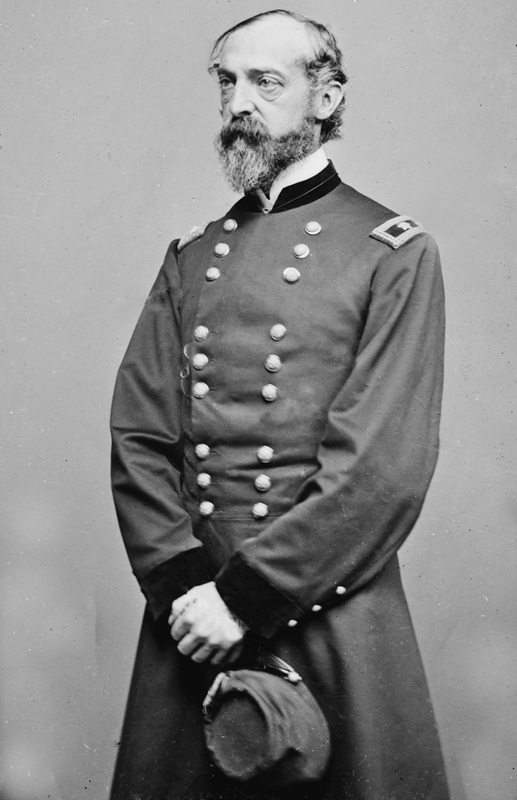 While Grant had also finally defeated the Army of Northern Virginia, he could not have done so without men like Maj. Gen. George G. Meade. This entry was posted in Armies, Battlefields & Historic Places, Battles, Campaigns, Civil War Events, Leadership--Confederate, Leadership--Federal, Memory, Personalities, Sesquicentennial and tagged Appomattox Court House, Army of Northern Virginia, Battle of Gettysburg, Battle of Spotsylvania, Battle of the North Anna River, Battle of the Wilderness, George G. Meade, Lee's Retreat, Mexican War, Philip Sheridan, Robert E. Lee, Siege of Petersburg, U.S. Grant, Wilmer McLean. Bookmark the permalink. 6 Responses to Where Was George Gordon Meade? Meade’s sense of duty and patriotism have always inspired me. He was clearly not a member of the Grant-Sherman-Sheridan clique that ran the army after the war, but he was a soldier through and through. Dan, nice write up. Chamberlain claims, in a post-war interview, that Warren and Meade both died of a broken heart, regarding the way they were treated by Grant. He also said that Humphreys would not allow them to break his heart. Not sure if you have any thoughts on that. Thanks Kris! That is interesting. While I’m sure that Meade probably harbored some ill feelings toward Grant, I don’t think he ever shared them publicly. At the same time, I’m not sure if Chamberlain was exaggerating a little; Meade passed away from pneumonia. Additionally, Meade was a supporter of Grant during the 1872 Presidential Election. I had never read that Meade and Sheridan came to blows…Will have to read Lyman’s book again. Meade remains one of the great unsung heroes of the war. His devotion to duty rivals that of Lee’s, although Lee of course has gotten so much credit for it while Meade has been–as in so many other ways–forgotten. Thanks for giving the man his due.